Well, you know it's gonna come. The day your child's pet enters the world beyond. Whether it's a dog, cat, fish or snake. It doesn't matter, it hurts. 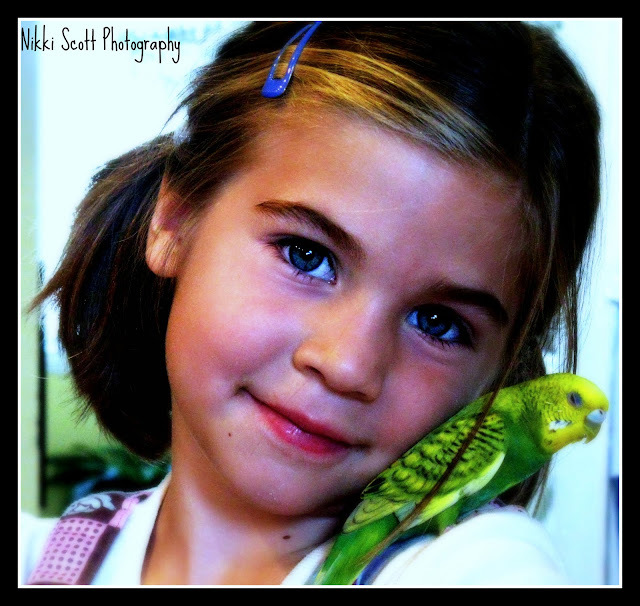 My daughter, Paige had her own bird, a budgie named Tango. Tango was a great companion for Paige, the only female pet we owned and she had her home in Paigey's room. She had her bird cage set up on Paige's bedside table. Every night we would read our bedtime story and then say goodnight to Tango and put her cover over her cage. Paige was happy and comforted knowing she had Tango with her throughout the night. We told Paige time and time again that budgies don't live very long and she had to be prepared for one day when Tango would go to Heaven. That day was today. I heard an unusally loud noise coming from the cage and went in to find Tango lying on the bottom, clearly not sleeping. I went straight to my husband while Paige was curled up on the couch watching Treehouse completely unaware what was happening. Trevor quickly got the cage outside and then we had to decide how we were going to break the news to our little girl. We came to the conclusion that it would be a life lesson for her to see Tango, say goodbye and help daddy bury her in the back garden. I took a deep breath and went into the living room, turned off the T.V., got down to eye level and gently told her the news. She didn't seem too upset, but more curious at that moment. "Where was Tango?" She wanted to see her. I sent her outside to see daddy who was ready with the limp budgie in his hands. Paige had many questions, and wanted to hold Tango, "Why was she so soft?" "Why can't she lift her head?" Trevor and I answered her questions all the while waiting for the realization to set in ~ her companion was gone. When she was ready, Trevor took her over to the garden and let her pick the perfect spot, right beside the little garden cross we had put there to remember her Grampa. Trevor got the shovel and dug a deep hole. Pagie bent down and gently layed Tango to rest. She then stood beside her daddy holding his hand the both of them taking a moment to say a little prayer. Paige then turned and crushed her little face into her daddy's legs, letting out big loud sobs.....it had hit her....Tango wasn't coming back. I was watching from the window and was ready. Trevor picked her up and carried her up the back stairs and into my waiting arms. I took her to cuddle and cry and console. She would lift her head every few seconds and try to say something that really just came out in big stuttery sobs, then wrap her arms around me even tighter and cry even harder. Her big brothers came out from their bedroom, daddy came in from outside and we all sat together in the living room as a quiet strength for our shattered little girl. We all waited for her hurt to subside and answered any questions she had about life and death. That was it, that was the first death; pet or otherwise that Paige was old enough to understand. I think we handled it pretty darn good. I'm proud of our family, I'm always so touched to see all my children gather around when there is a family member that needs them. Paige recovered and learned a valuable life lesson, one that she will have to endure many more times. Of course it didn't hurt that daddy promptly took her out to the pet store and came home with Courtney....Paige's new hamster! !